There are plenty of reasons why one user wants to use a sync (acronym for synchronization) software utility. For example, an user may want to get a copy of files, which can be pictures, images, audio, music, videos, documents and etc. from source location and duplicate to another place, or there is a need to keep files in two storage locations exactly in sync and always the same. In some cases, sync files across different hard disks provide easy mean to backup or RAID alternative. To easily synchronize file and avoid the hassle of manually copying and managing files in many different folders and drives, a synchronization application software or utility is needed. SyncToy is a free PowerToy that provides an easy to use, automatic, highly customizable program that helps users to do the heavy lifting involved with the copying, moving, and synchronization of different directories, all in graphical user interface (GUI). 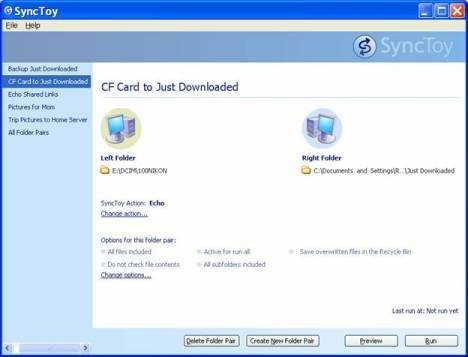 SyncToy sync utility works by requiring users to create “folder pair” (set of two folders) that represents the two folders (“left” and “right” folders) to be compared and synchronized. These folders can be on the local drive, on an external device such as a USB flash drive, portable hard disk and digital camera, on Flash memory card such as CF, SD, MMC, Memory Stick and xD via card reader, on mapped network drive, or on a network share from another computer. Best of all, SyncToy can manage multiple sets of folders at the same time, each can be configured to act in different rules or actions. Offer three different types of operations to synchronize two folders: Synchronize, Echo, and Contribute, where Synchronize is two-way sync, while Echo and Contribute is one-way sync with Contribute does not delete any files on the right folder that may have been deleted on the left folder. Save bandwidth, disk space and time as sophisticated rename feature that matches files or images that are the same, but have different names reduces duplicated files. Able to keep track of renames to filenames and reflect the changes to file names over to synchronized folder. Able to type in a UNC path. Preview the sync operating to perform without actually syncing. Folder pairs are saved, and can be repetitively synced, or use at once time sync. Support for long folder pair names and ability to widen the left pane to see those longer names. Ability to support the maximum length for deep folder paths. Better handling of the difference in precision between NTFS and FAT timestamps. Can schedule SyncToy using the Windows XP or Vista Task Scheduler. Support for 800×600 screen resolution. Warning for users if the selected action will take some time to complete. Brief explanations for the actions in the user interface. Improved behavior when choosing folders to include or exclude when there are large numbers of folders involved. Improved support for accessibility modes. One major minus on SyncToy is it won’t watch the folder designated to sync and synchronize automatically whenever there is any change detected. The best alternative is to schedule SyncToy to run automatically using Task Scheduler. In Windows, most users will probably notice that drive letter assignment of external drives, especially USB Flash Key or digital camera will change. SyncToy can handle the ‘jumping’ and changed drive letters problem by looping through all existing drive letter assignments and attempts to locate the correct synchronized folders, which contains SyncToy[ID].bin file. If the original synced folders are located, the new drive letter will be associated with the folder pair and the folder pair will be executed. Download SyncToy version 1.4 (direct download link to Setup.msi) (no longer available). Microsoft .NET Framework v2.0 is required. SyncToy 1.4 is the last stable version release for SyncToy for Windows XP and Windows Vista, and improved SyncToy v2.0 beta is also available for free download. For users who want more examples and usage guides to visualize and learn how and what’s the best practice to use SyncToy, download the SyncToy white paper version 1.1 (no longer available).